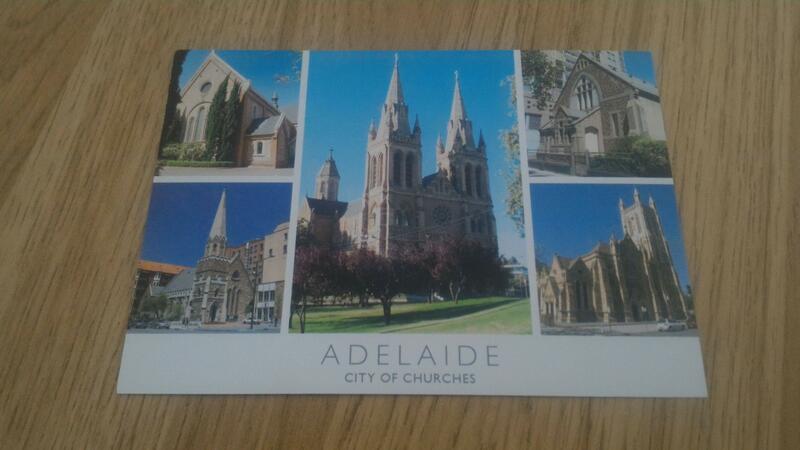 Summary: Recently went on a road trip to Adelaide, bought one of these picture postcards to send to someone. Question: This is the first time I'm sending one of these so sorry if it's a stupid question, but how do you send this? 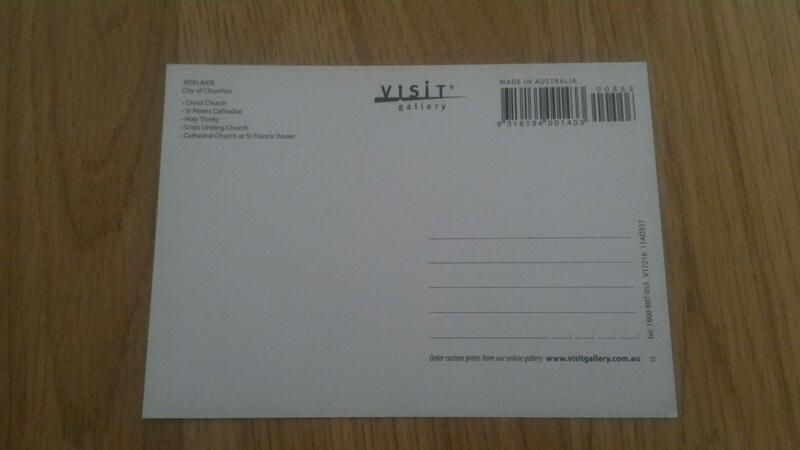 Do i need an envelope or can i stick a stamp somewhere (cant find where) . And where can I write a message? Edit: Just an update ,Australia does not provide special postage stamps for picture cards, it costs same as a normal letter. I've sent the card, thanks. You don't need an envelope - these cards are intended to be sent as is. On the reverse of the card there is a blank area to the left: your message goes here. The address goes in the lined area to the right. The stamp goes in the top right corner above the address. Some cards have a rectangle printed there to indicate the right place. Your card has a barcode printed there: just stick your stamp(s) over it. 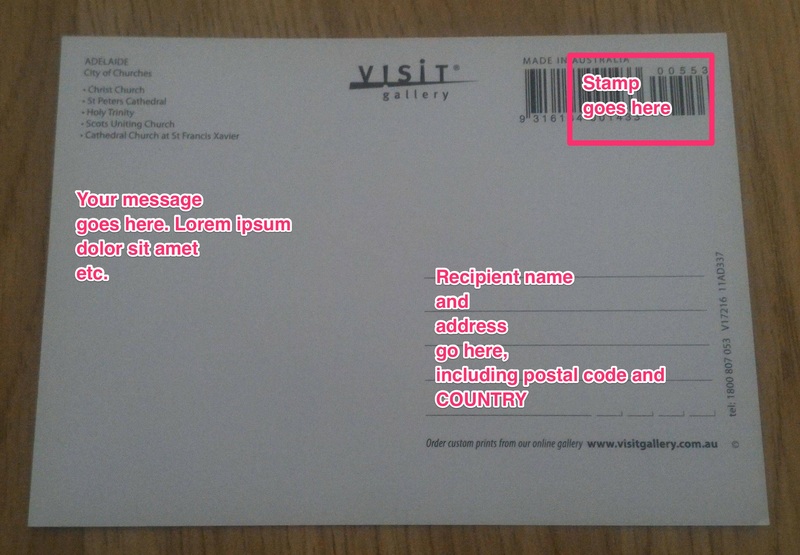 If sending within the same country, you can omit the country name in the address. When sending to a different country, you can write the address (except the "Country" part) in the destination country language. Postcards are for direct mailing and often enjoy a lower postage rate than envelopes. They are more vulnerable to damage and marking, but that, and the stamps and cancellation, may add to the charm. The stamp goes in the upper right. It must be on the same side as the address. This, and some fluorescent dye on the stamp, is used by the sorting machines to face (orient) the mail piece, so the machine can OCR-read the address, which can succeed if you print neatly. This will greatly speed up processing. In the US at least, postcards are First Class aka Priority Mail. And will be handled at that speed, except for the handwriting issue. This is not obvious, but they put their ugly barcode exactly where the stamp must go. This is to not waste space and to help hide the barcode. The local post office may be able to advise which stamp or combination of stamps will fully cover it. Nothing more romantic than a jumble of mixed foreign stamps, you might even do that gratuitously! To move internationally, certain specific stamps may be required. Extras / overpaying postage is harmless on postcards, but don't do it on packages. The address goes on the provided lines. If there are two sets of lines, the lower or right one is for the main address. The return address should be smaller, above, and if possible to the left. The return address is meant to be the sender's, but who would know? If you hand walk it into a post office, some clerks will cheerfully cancel it "old school" for the classic look. Not the answer you're looking for? Browse other questions tagged australia tips-and-tricks mail or ask your own question.